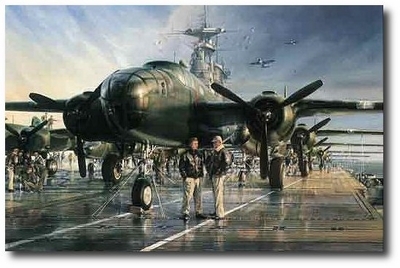 Overall size: 27" X 35"
Lt. Col. James H.Doolittle confers with Capt. Marc A. Mitscher on the bomber-laden deck of the U.S.S. Hornet as the fateful day of 18 April 1942 approaches. This daring bombing raid on Japan gave America and its allies a badly-needed morale boost in the wake of the destruction at Pearl Harbour.